Oh, a swimming pool, it represents summer, fun, playing, as well as all things happy and light. With shark in the pool, mermaid races, and other fun pool games, swimming has been an exciting way of spending time with friends and family. Unfortunately, swimming pools need to be maintained for the reasons we have seen above. Your pool needs to be spotlessly clean and to be spotlessly clean, you need to use chemicals. Due to these chemicals, you need to regularly test your swimming pool using the best pool test kits. These kits will enable you to ensure that the chemicals are enough to maintain the cleanliness of your pool and to the level that isn’t harmful to the swimmers. With that in mind, there are hundreds of pool test kits on the market today. Generally, some are popular than others although they all offer almost the same level of accuracy, assuming you use them correctly. First, you need to understand the various types of pool test kits, which are digital (measured using digital sensors), photometric (measured using a photometer), turbidimetric (measuring cloudiness of the water), titrimetric (color changing), and colorimetric (color matching). One type of kit might include at least two types of test. The most common tests found out there are the last three, which requires you to add reagents drops to the sample to get the result. Another thing to know is the chemicals found in your swimming pool. This is critical to ensure that your pool will remain balanced and hence, safe. There are dozens of chemicals found in your swimming pool that will enable you to know which test kit will work for your pool. Sodium Bicarbonate – The chemical and compound sodium bicarbonate mainly raises the total level of the alkalinity in your swimming pool. Bromine – This element mainly stabilizes the pH level and acidic level of your swimming pool. It ensures that the water doesn’t become excessively acidic. Calcium hardener – Like the name suggests, this chemical boosts the level of the hardness of calcium in your pool. Calcium hypochlorite – This chemical raises the level of chlorine in your pool, hence, it purifies your pool and eliminates algae. Cyanuric acid – Cyanuric acid mainly stabilized the level of chlorine in your pool. It also protects your pool against UV rays. It is infused into trichlor or dichlor. Chlorine – This element is often called dichlor or trichlor. Both chlorinate your swimming pool with the main difference being that trichlor needs to be attached to a chlorinator while dichlor doesn’t need to. After understanding the type of test kits found out there and the chemicals present in your facility, it’s the right time to ask yourself a couple of questions that will give you an insight of what you really need. How much do I want to spend on test kits? Generally, photometric and digital pool test kits are costlier than the other three models. You can get the three models for under $200 while the two models go for over $300. Set your budget. Who will use the kits to test? Colorimetric and titrimetric test kits might be the best choice if you are the only one who will be using the kits. Photometric will be a great choice if there are many people who will use the kits. With the colorimetric kit, the results might vary from one user to the other depending on their own visual insight. Women have fewer problems with color than men, young people have fewer issues with color than older ones, and we all have our opinion of different color shades. In addition, the light and background might also affect the results of a colorimetric test kit. Photometric removes guesswork since it uses the sample and always offers the same results – as long as the instructions are adhered to. What will I be testing? The best kit will cover all the basics – calcium hardness, cyanuric acid, pH level, free chlorine, total chlorine, and total alkalinity. Some might even test salinity, metals, temperature, and phosphates. You may opt for a high-end photometric kit that will test everything or simply go for a normal color/titrimetric kit that will do the job for you. What will be the accessibility of reagents? Do you want to be getting your reagents locally or be ordering from abroad? The majority of pool owners prefer a kit that is available in the local stores so that the reagent can be easy-to-access. What are my state’s legal regulations? Many people fail to confirm with their local authority when it comes to purchasing pool test kits. Your state might have specific guidelines which your kit should adhere. Ease of use – Buy a kit that is easy and comfortable to use – the one that won’t intimidate the users. 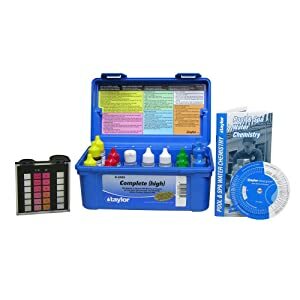 Completeness – Good kits will come with a test for pH, sanitizer, recommended range for all measurements, and complete test guidelines. Better kits will test adjustment to pH, total alkalinity, measures the amount of chemical, and differentiate between combined and free chlorine. The best kit will test cyanuric acid, calcium hardness, and iron and copper. Accuracy – The right results for all factors need to be tested to know the right water treatment amounts. Consistency results – It’s important to repeat the test to get note any change before it affects your swimming pool. Suitability of testing method – Results need to be shown in values/terms you can comprehend easily. Appropriate design – The kit needs to be well-designed for your poolside use. It shouldn’t feature glass or brittle plastic material which can cut swimmers if left in the water. Durability – You will be using your kit daily or weekly and hence it should last – withstand wet environment and be tearproof and waterproof. Independent manufacturer – You should purchase a kit from a brand that doesn’t offer treatment chemicals to prevent biased presentation. Value – The most expensive kit might not be the most effective. However, this doesn’t mean that the cheapest kit is the best one; actually, your kit should be inexpensive and indispensable. In a complete test kit, you will receive a casing which is used to carry all your testing components. Inside the case, you will see color scales constructed of UV protected color chips. These scales are used to mix the solution with the water to determine its chemical levels. You will also receive pool test strips which you will use to check the outcomes – you can also use them to keep the chemicals. Lastly, you will receive the solutions that are used to check your swimming pool filter chemicals and cleaners. Many pool owners love the Poolmaster 22260 because it is affordable when you compare it to other brands out there. Don’t be fooled by its unbelievable price, it still offers the accurate readings you need to help maintain your pool water chemistry. The unit uses color to provide the reading but doesn’t worry about the accuracy because it provides easy-to-read results. The kit also comes with clear round test blocks which features amazing matching color lids to their respective solutions. With a complete package and an effective performance, we may state that it’s worth trying Poolmaster 22260. Comes with easy to read its results. A simple kit that offers quick results. This product offers a complete package for testing your swimming pool water chemistry. It usually tests for total chlorine, combined chlorine, calcium hardness, alkalinity, cyanuric acid, and pH level. It also comes with a comparator that ensures you use the least time when reading the results. Although Taylor INC K-2006 is a bit costlier than some brands on the market today and even seems more complicated for the rockies, you will love its ease of use as well as the accuracy it offers without the worry of matching colors. Furthermore, the kit comes with the FASDPD bromine test kit and it’s able to differentiate between free chlorine and total chlorine. Comes with 75 oz of reagents. Accurately monitor your facility’s salt level with Taylor INC K-1766 from Taylor Technologies. This test kit aids you to keep your salt level at the desired level all season. 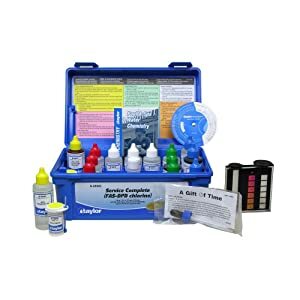 Taylor is a liquid pool test kit that will offer you precise results in minutes and prolong the life of your swimming pool and equipment by offering fast and easy maintenance. The product uses argentometric chemistry approach to testing and it tests the sodium chloride in your swimming pool. The best feature of this kit is that it comes with a heavy-duty waterproof case. Comes with complete testing instructions. Features a heavy-duty carrying case. Comes with silver nitrate reagent. Doesn’t test all your water chemistry. Taylor Tech K-2005 maintains safe pool water for your pool to ensure that you take a dive any moment you want. 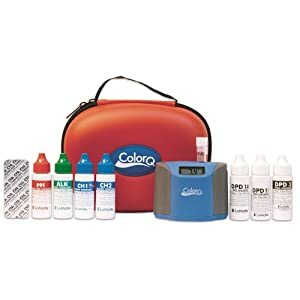 This is an essential testing kit that offers precise test results when checking your pool water, especially commercial spas, and swimming pools. The product was specifically designed to offer routine testing and comprehensive results done by semipublic, public, and technician pool operators as well as other professionals. The kit uses printed color standards to attain an accurate and reliable color match, making regular test comparisons easier. The product features 6 different standards for bromine, pH, and chlorine. It also comes with 9 tests for effective testing including free chlorine, total chlorine, bromine, acid demand, bromine, total alkalinity, base demand, cyanuric, and calcium hardness. Offers a safe swimming pool. 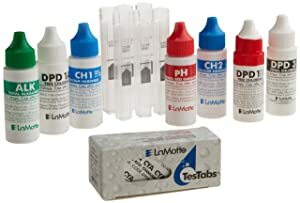 LaMotte R-2056 Test Reagent Refill Kit comes with a 30 ml bottle of DPD 1A liquid reagent for free chlorine, DPD 3 liquid reagent for total chlorine, and DPD 1B liquid reagent for free chlorine. It also features pH liquid reagent for pH, a CH2 liquid reagent for calcium hardness, ALK liquid reagent for total alkalinity, 5 ml color Q 6 test tube, and CYA test tabs for cyanuric acid. The kit offers you precise results and is easy to read, understand, and interpret the results. Allows you to test all aspects of your pool. You will need a tracer pocktester to test salt. 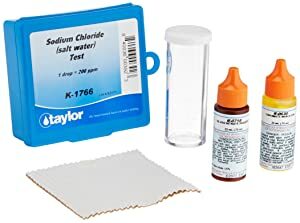 The Taylor K-2006C swimming pool test kit looks like PoolMaster which we looked at above. However, its distinguishing feature is the reagent bottles which it comes with. It is accompanied by 2 oz. of reagent bottles which saves you money that you would have spent on purchasing reagent when you want to use your kit. The product can test for the base, acidity, calcium hardness, pH, chlorine levels, and alkalinity. This offers you all the required tools to make your swimming pool clean all season. The other great feature of this unit is the printed color comparator which is a great tool that helps you understand and interpret the test results. Taylor K-2006C comes with indicators, calculators, comparators, sulfuric acid 12N, reagent, and DPD powder. Comes with a comprehensive manual. 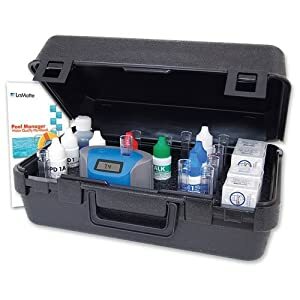 LaMotte R-2056 is an effective digital pool test kit that features water-resistant cover. This ensures that your kit doesn’t get destroyed even if you use it daily. The best feature that makes it one of the best kits out there is the photometer – it provides a digital readout of the outcomes, making it easier even for rockies to comprehend. LaMotte R-2056 is able to test for bromine, total chlorine, alkalinity, free chlorine, pH, and cyanuric acid. Its dual-optic construction provides a superior accuracy. This makes it one of the top brands for testing your pool in 2019. Uses liquid material to test for water chemistry, except cyanuric acid. You need a tablet to test cyanuric acid. The best thing about Lamotte ColorQ Pro 11 is that you only need about five drops of reagent to get the results you want without looking at color matching or chats. It boasts of the latest technology, a water-resistant cover, and an easy push-button control to offer you the best and easiest of time when using it. Although it is one of the priciest testing kits on the market today, its machinery and technology make it a great investment that will last for decades. You can rest assured of getting accurate results every time you use this kit with numbers as opposed to confusing colors. A strong and durable kit. Comes with a superb 5 minutes auto-off feature. Easy push-button control for better control. 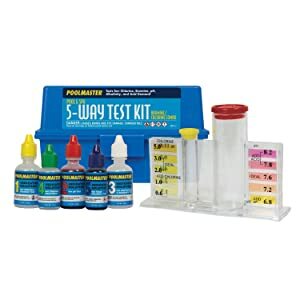 We would recommend you to try the Poolmaster 22260 5-Way Test Kit since it is affordable and offers easy-to-read results. 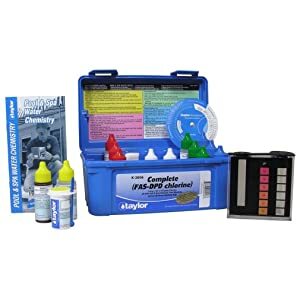 It also tests for almost all the water chemistry in your swimming pool including pH, total alkalinity, cyanuric acid, total chlorine, calcium, and free chlorine. Generally, testing your pool should involve 4 areas or aspects. These areas are mainly the pH level of the water, the hardness of calcium, the level of the cyanuric acid, and alkaline of the water or the total amount of alkalinity. Before we look at the steps you should follow when testing your swimming pool, let’s look at how often you should test your swimming pool. You need to note that some of the five water balance tests are often more stable and do not need to be tested daily. With that said, follow this guideline when testing your pool chemistry (at least that what I do). I always try to keep this schedule but sometimes I forget the daily test of chlorine and pH level – that’s okay if your filters are functioning and the chlorinator (salt system) is working. Once you determine your swimming pool chemical composition, you can reduce chlorine and pH test to weekly too – when the weather is calm and cool and everything is working well. Test daily when the weather is hot, if your pool is used daily, after storms or rain, or if the water doesn’t look right. Ensure that you get the right strips for your pool. Also, ensure that you have vials – you will use them to store the water that you wish to test. Dip the strips into your pool. This purpose of dipping them is to collect a sample of water that you will need to test for various chemicals. In every section or part of the test, put the water inside a vial. Keep checking for your pool’s water factors or chemicals. Test your swimming pool at least two times a week. Testing your pool chemical determines if your pool is balanced. Here are four benefits of having the best test kit for your swimming pool. It helps to protect your pool from the undesired effect of UV sun rays (breakdown reaction). It enables you to know the number of dissolves elements in your facility so that you can determine when to add fresh water. It keeps your pool clean from different substances including dirt, bacteria, and algae. It ensures that you use the right amount of chemical when cleaning your pool to avoid harming people. Q: Which pool test kit will offer me the most accurate results? A: Test strips produce varying results than liquid kits, which use titration tests. Titration tests are more precise when testing your pool while using dry tab reagents can increase the level of accuracy. Q: How will I know the amount of chemical to add to my pool? pH decreaser – 6 oz dry acid for every 0.1 desired decrease in 10K gallons. pH increaser – 6 oz soda ash for every 0.1 desired increase in 10K gallons. Hardness increaser – 12 oz calcium chloride for every 10 ppm desired increase in 10K gallons. Alkalinity increaser – 20 oz sodium bicarb for every 10 ppm desired increase in 10K gallons. Pool salt – 8 lbs of salt for 100 ppm desired increase in 10K gallons. Cyanuric acid – 14 oz for every 10 ppm desired increase in 10K gallons.